This body pillow from ComfySure is designed specifically for the pregnant and nursing mother. It is made from hypoallergenic materials and is built with a quality mold. This pillow will allow you to have a restful night with all the comfort and support you need with your changed body. The ComfySure U Shape Full Body Pillow is ideal for those who sleep on their stomach or on their sides. Multi-purpose – use for sleeping, nursing, watching TV etc. This body pillow from ComfySure is a great option for mothers and mothers to be. It is large and comfortable while providing the support you need both from the back and from the front. It provides this support through its U-shaped design which allows it to cradle your body. With the ability to pull heat away from your body and release it out of the pillow it will keep you cool and thereby provide a more comfortable night’s sleep. 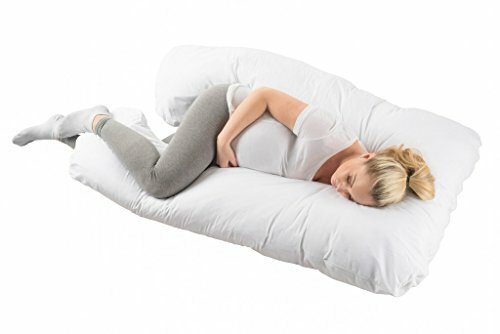 The ComfySure U Shape Full Body Pillow is large enough to support you through a number of sitting and lying positions as well and you will not regret your purchase of this pregnancy body pillow. Whether for sleeping or relaxing, we have you covered in our ultimate guide - and it's FREE!